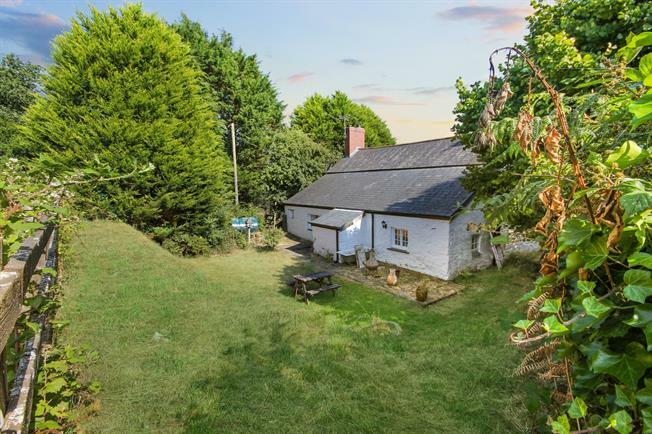 3 Bedroom Detached Cottage For Sale in Bodmin for Guide Price £575,000. This character three bedroom cottage has recently undergone a total refurbishment and reconfiguration to make a delightful home set in a quiet rural position. Set in grounds of approximately 3.5 acres this property also boasts a large timber barn which has multiple uses including storage of cars or boats to name a few. Further to this there is a well fenced paddock measuring approx. 2.5 acres with access past the cottage or there is separate access via a gate off the lane at the far end of the field which is ideal should somebody be looking to rent out the field or do livery. The cottage is has traditional central entrance where the sitting room is located on your left. The focal point of this room is the quaint fireplace with wood burning stove, brick and stone surround with further character evident with exposed beams, which for a cottage are higher than average and a delightful window looking out onto the front garden. The kitchen has recently been moved to the front of the cottage and now is a fabulous room with a seamless mix of traditional features and contemporary fixtures and fittings for modern convenience. There original flag stones have been bought back to life and the inglenook fireplace neatly houses the electric range style cooker. There is ample storage with the cream gloss floor units and central island which are both crowned by timber worktops. The island is discreetly on casters which allows you to move it if needed and lock into place when stationary. The rear of the ground floor has both the bathroom and utility / boot room. The bathroom is bright and airy and has a freestanding bath and sink. This room is finished to a high standard and is in keeping with a property of this character. Completing the ground floor is utility room which for a property of this size is larger than normal. The rear door is out of the utility and leads onto the rear paved area which is ideal for alfresco dining and is highly private. The first floor accommodation has the master bedroom located on the left at the top of the stairs and oozes character with rough walls and a multi paned window and deep sill window seat looking over the formal front garden. The remaining two bedrooms are on the right of the landing and are also equal in character to the master bedroom and also look over the front garden. Externally the property has a 'secret garden' which is located to the side of the cottage and is surrounded by trees making a very private space and when the sun is shining is a genuine sun trap. Potential exists with disused stone outbuildings that could be converted for further accommodation (subject to permissions). The aforementioned paddock and barn coupled with this refurbished character cottage in all make an outstanding opportunity to purchase a delightful rural property close to a lovely village and yet within easy access to the A30 for further amenities. The property lies approx. 1 mile from the small picturesque moorland village hamlet of Mount. The thriving village of St Neot lies some 3 miles to the east of the property. At St Neot there is a post office/general store catering for day to day needs, a well respected primary school and a thriving community village spirit. A more comprehensive range of shopping facilities can be found at either Bodmin or Liskeard. Both have supermarkets, doctors, dentists and veterinary surgeries and Bodmin has mainline railway station serving London Paddington (via Plymouth). The A30 trunk road is less than 4 miles from the property which links the Cathedral Cities of Truro and Exeter. The following services are available Mains electricity Mains water supply, private drainage, Oil central heating and telephone connection although we have not verified this. Council Tax Band 'E'.